A Sunday afternoon performance at Carnegie Hall! The event that our Philharmonic Ensemble had been rigorously preparing for since September arrived yesterday. It was spectacular. 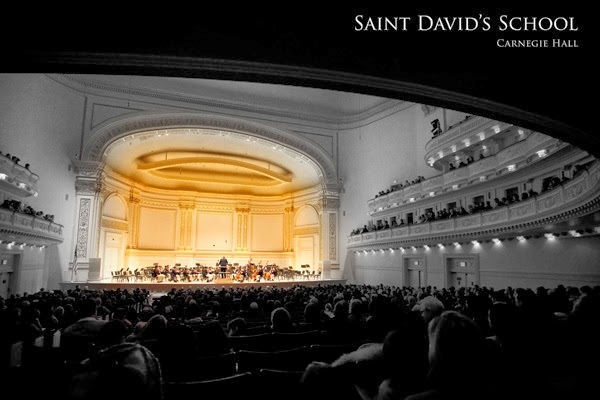 Saint David's Philharmonic Ensemble took to the renowned stage with a confidence that comes from talent, preparation, and passion, giving spirited interpretations of works by Handel, Vivaldi, and Gliere and closing with the always popular theme from Mission: Impossible. They may have been the smallest in literal height and ensemble size that took the stage last night; but they sure made up for it in quality and tightness of performance. I was proud of our boys and the alumni that joined them; they represented their school with distinction. A special acknowledgement goes to Ensemble Director Philip Hough, who has been inspiring and guiding the boys all year. 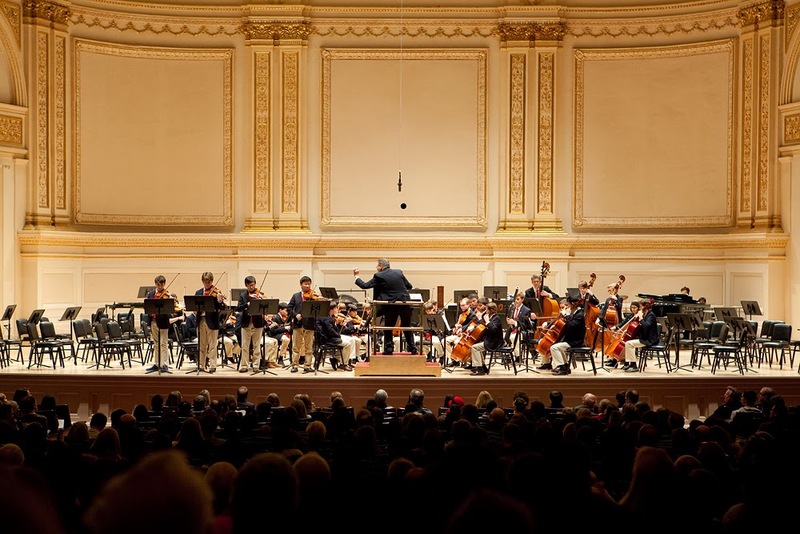 The Festival of Orchestras at Carnegie Hall occurs every three years and includes stellar performances by the Middle and Upper School Orchestras of Brearley, Collegiate, Rudolf Steiner, UNIS, Packer Collegiate, and Saint David's. Several of the boys had to leave the reception following the performance early to play hockey for Saint David's. From the stage of Carnegie Hall to the ice of rinks of New Jersey--Saint David's boys can cover it all! Our Winter Festival of Art and Music culminated with this morning's Winter Concert in a packed-to-capacity Hyman Hall. The concert was phenomenal with energetic performances by our Philharmonic Ensemble, Percussion Ensemble, and Chamber Singers. 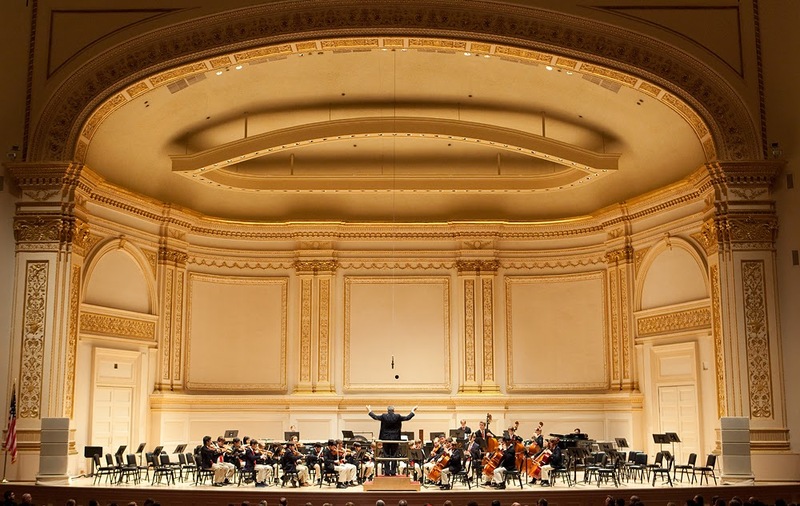 The Philharmonic Ensemble performed the program they will play this Sunday at Carnegie Hall: Le Rejouissance, Concerto for Four Violins, Russian Sailors' Dance and the Mission: Impossible Theme. Two alumni, Alex B. '13 and Justin C. '13, joined us for the Vivaldi Concerto. 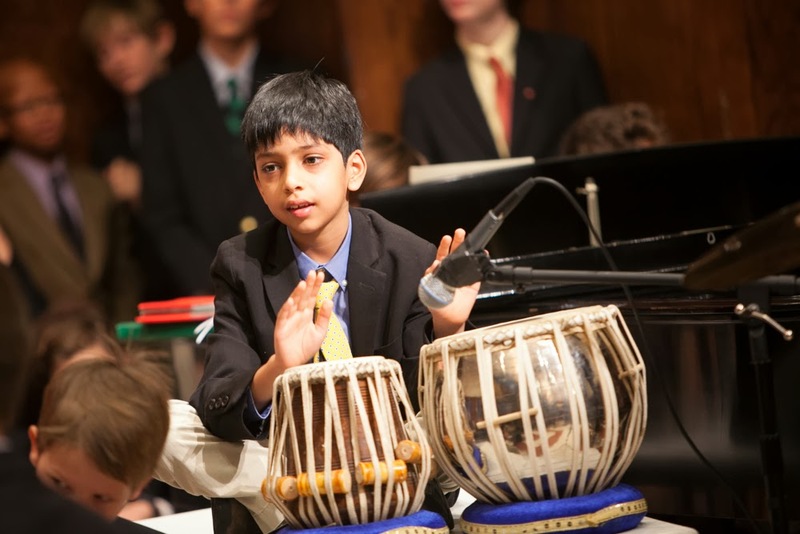 The Percussion Ensemble performed Qualeygo--a traditional rhythm from Ghana, and Morning Raga, featuring the Indian tablas played by one of our second graders. The Chamber Singers performed a reprise of two songs from Lessons and Carols, and closed with a moving performance of U2's MLK featuring a sensational trumpet solo. Kudos to all of our young musicians and their teachers! Saint David's is truly alive with music! Saint David's now offers a variety of summer programs for our boys that will begin in June right after graduation. In addition to the ongoing Summer Sports Camp (Grades K-6) and Spain Summer Study (Grade 7)--now in its fourth year-- we have two new weeklong programs for Grades 5 and 6: The World of Enzymes and Secrets of the Civil War, in partnership with the DNA Learning Center of Cold Spring Harbor and the Gilder Lehrman Institute of American History, respectively. The art work of all of our boys is on display for the Winter Art Show, part of our Winter Festival of Art and Music. The Festival is warming an otherwise particularly cold week. The Winter Art Show displays the boys' work from first trimester art, shop, and pottery classes. They are now on display throughout the school. 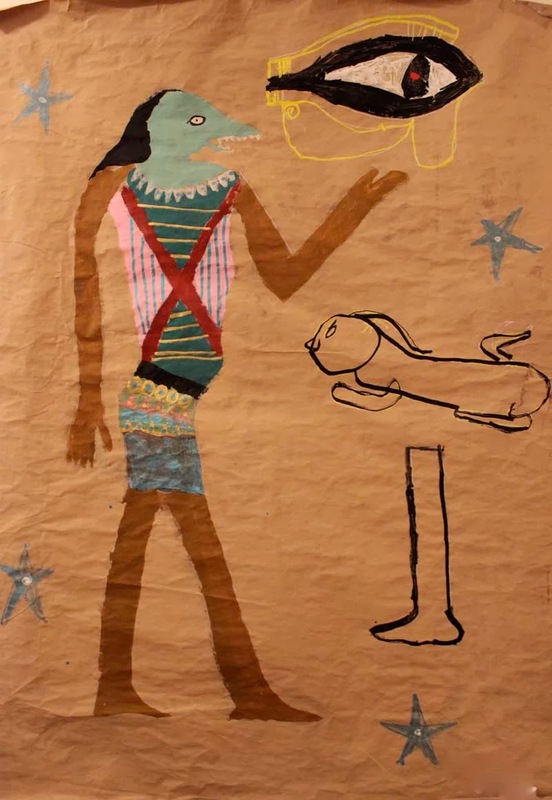 A look at the art displayed reveals how art classes at Saint David's reflect the interdisciplinary approach to learning that we have incorporated throughout the curriculum. Boys in Omega study jobs and careers, in related art classes they create water color self-portraits. In the portraits they are dressed as someone in the career of their choice. First graders who study the landmarks and geography of New York City in social studies create works in the style of Kandinsky that depict an imaginative view of their city community. 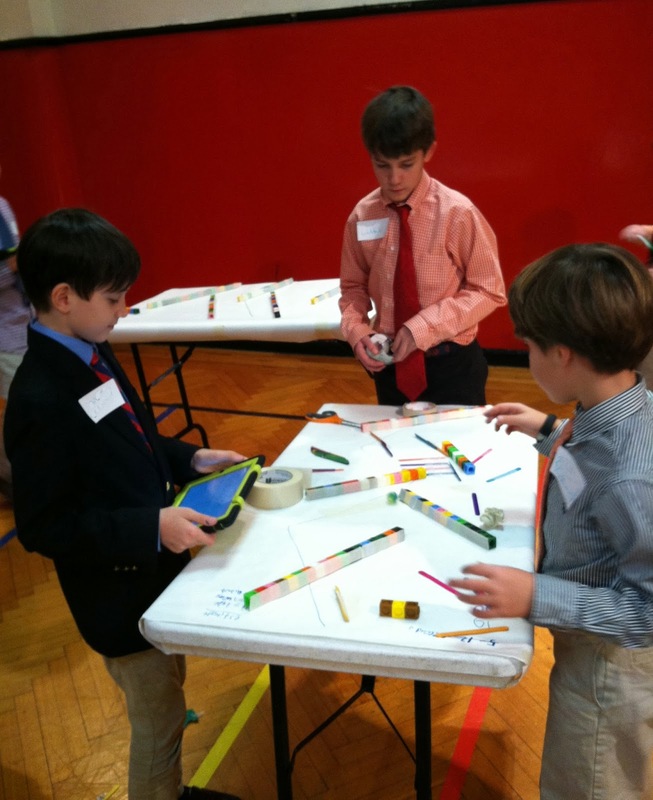 Third graders employ basic design technology as they construct machines with wheels, axels, and levers. Eighth graders hone their skills in observational drawing in preparation for their upcoming humanities class trip to Italy where they will sketch insitu. The beautiful, thoughtful works of art our boys create are impressive. They are created with thought. 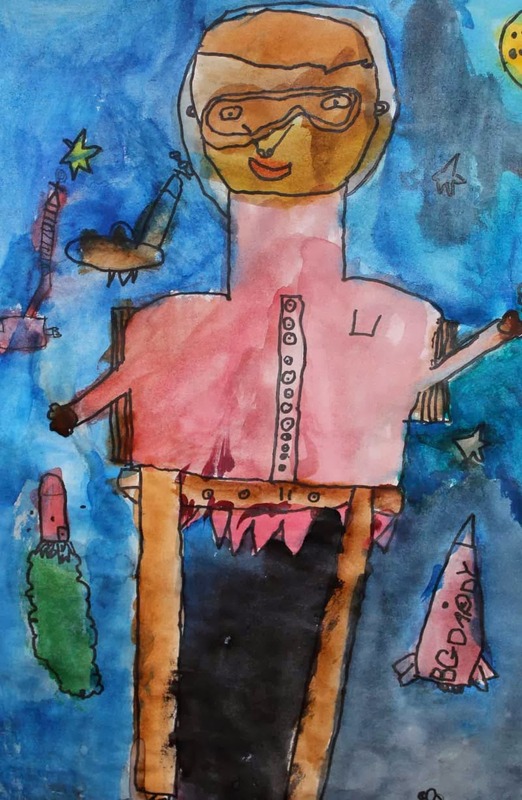 These are works of art created through careful study of master artists, analysis of the elements of design, and connections the boys made to what they are learning in art class and other disciplines of knowledge. The art our boys produce underscore our value of 'the aesthetic' at Saint David's. A Great Man; A National Leader for "The Good"
In preparation for the long weekend, last week Saint David's held special Chapels for all boys in Grades 3 through 8 commemorating the life and accomplishments of Dr. Martin Luther King, Jr.
We began these commemorative Chapels by engaging the boys in a discussion about Dr. King's legacy, eliciting their thoughts on the contributions of the Civil Rights leader, the Founders' promise that "all men are created equal," the country's struggle to realize this promise, and King's vision of the future during those turbulent 60s. By linking Lincoln's Emancipation Proclamation (which I shared with the boys) of January 1, 1863 to the Republic's founding documents of the late 1700s, to King's 1963 speech on the steps of Lincoln's memorial in Washington one hundred years later, and his deft ability to influence and effect dramatic change, not by sword, but by word, we got the boys thinking. This was followed by one of our boys reading, in its entirety, Dr. King's "I Have a Dream" speech, which captivated even our youngest classes. It's important for the boys to hear the original words and text, to study it and connect it to the history of their country and to the issues, ideas and ideals expressed at the nation's founding and experienced by them today. The Chapel concluded with our very own Mr. William Best, singing Dr. King's favorite song "Take My Hand, Precious Lord, Lead Me Home," with the boys joining in. A clip is attached. Our school's ultimate aspiration is for our boys to "be good men." What better inspiration than that of the life and work of Dr. Martin Luther King, Jr.? Yesterday, we kicked off the Engineering 101 after school class. 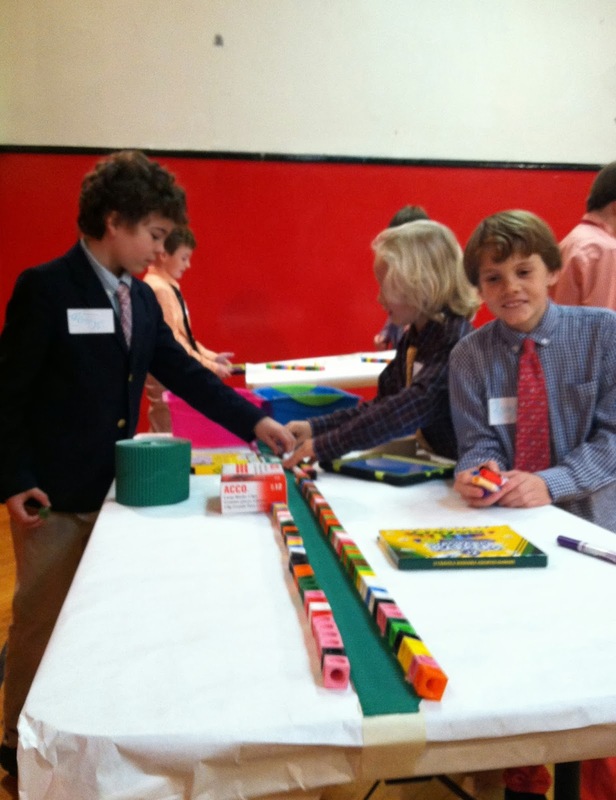 Nine boys (4th and 5th graders) worked collaboratively on an open ended engineering challenge. Groups of boys stood at folding tables propped up on one side. They were given a hi bounce ball and, using an iPad, they timed how long it took for the ball to roll down the slope when released at the high side. On average, this took 1.5 seconds. The boys were challenged to choose a number and turn their table and ball into a consistent timer for that number of seconds. Using a bevy of low tech arts and crafts materials, boys worked through numerous iterations of building, testing, observing, collecting data, and revising their solutions. Embedded were discussions about controlling variables (Do you release the ball from the same spot each time?) teamwork, managing frustration/learning from mistakes, gravity, elasticity, potential and kinetic energy, friction, to name a few! Boys beamed, high fived, occasionally argued, and even hugged! Facilitating were our Technology Director for Curriculum and an educator from the Museum of Natural History, who is a grad student in technology design. This year Saint David's has increased its STEAM programs, both in the academic curriculum and through its after school offerings. Now in its third year, the second session of our signature unit partnership with the N-YHS in the 2nd Grade began today. Archivists from the Society together with Saint David's teachers have been working together for several years designing and refining this exciting primary source unit in the second grade's history curriculum. Each of the photos below captures several of the stages of the the boy's 12-step session today with the N-YHS. They created a Dutch still life water color painting using original artifacts from New Amsterdam. Some of the artifacts presented, examined and then painted included a leather bucket, a tin lantern, a candle and candle holder, a candle mold and a hornbook. This still life exercise was inspired by a Willem Kalf painting, which is part of the museum’s collection. Our partnership with the N-YHS fulfills one of the school's major curriculum initiative goals: to bring the boys' study of the past into a tangible present. We believe that helping the boys connect with material/artifacts from the past in real and tangible ways helps them construct meaning, and is more enjoyable. Boys learn by doing. This 2nd grade partnership with the N-YHS around early New York joins similar signature units of study: in the 5th grade and our partnership with Cold Spring Harbor around science, the 6th grade and our partnership with Gilder Lehrman around US history at the Republic's founding, and the 8th grade and our partnership with The Met around Renaissance Art. This morning, our two school orchestras kicked off the annual Winter Festival of Art and Music with a special morning concert for the Lower School. Our youngest musicians, members of The First Orchestra, played for the first time this year in front of a live audience. 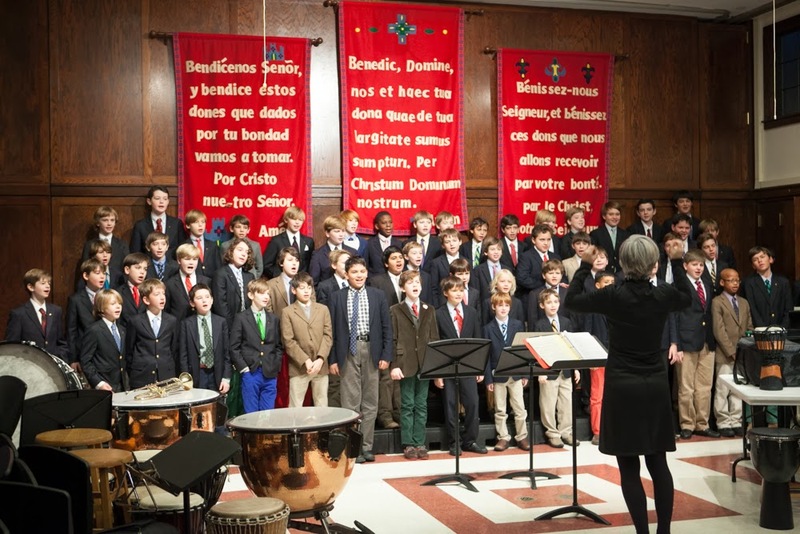 The boys, from Grades 1 – 3 performed Ode to Joy, Danny Boy, and Saint David's Alma Mater. 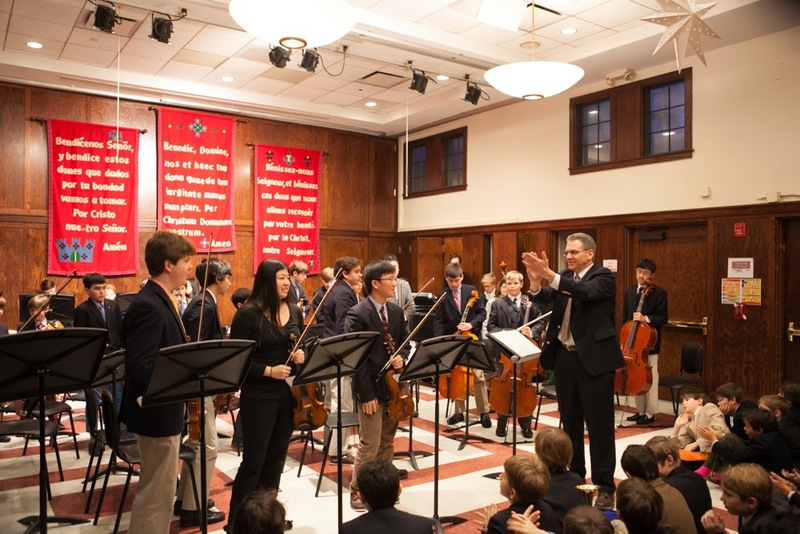 During the course of the performance, each of the boys stood to introduce a piece or share pertinent information about the orchestra's composition and layout, providing an important public speaking opportunity--a major curricular focus of the school's program. A brief clip of their Ode to Joy performance is included. The First Orchestra was followed by a riveting performance by the Saint David's Philharmonic Ensemble, which provided a preview of some of the pieces they will soon be playing on the stage at Carnegie Hall in a couple of weeks: Handel's Le Rejouissance, Vivaldi's Concerto for Four Violins, the Russian Sailors' Dance, and the Theme from Mission Impossible. Just fantastic to hear 11-14 year olds playing such complex pieces with such enthusiasm! 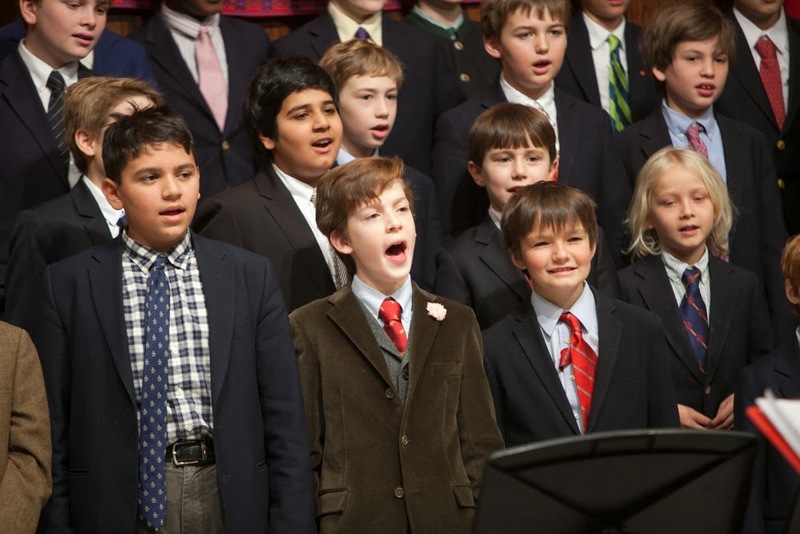 The Winter Festival is a special tradition at Saint David's, which celebrates our boys' creativity and the school's focus on the aesthetic as part of a balanced pedagogy. During the next two weeks there will be many events showcasing our boys' work in the arts. Drop by and visit. Programs are available at Reception. Today, we kicked off our exciting partnership with the DNA Learning Center of Cold Spring Harbor Laboratory for our new fifth grade STE(A)M unit on DNA. Boys also learned the necessity and history of classification, and became familiar with the parts and function of a compound light microscope. For this first session, educators from the DNALC visited Saint David's and engaged fifth grade boys in a lab experience. The boys learned about the functional variation among animal cells, identifying organelles and other structures by their scientific names, and began to discover that, in nature, form fits function. Today's lesson was the first in a series of sessions that will take place not only in Saint David's science labs, but also at the DNALC's lab in Cold Spring Harbor where our boys will examine and conduct observations of mutations in Drosophilafruit flies and C. elegant nematodes. The boys will also visit the center's DNA Laboratory for investigations and experimentations with DNA Fingerprinting - and an introduction to gel electrophoresis. Exciting, real world application, out-of-classroom units like this one demand that our boys think and analyze critically, engaging their scientific minds, while captivating their curiosity and imagination. Innovative, dynamic and engaging curriculum is a focus of the school.